We can’t rely on others to keep our communities safe from racists and fascists, it’s up to all of us. Now more than ever we need everyone to step up and play their part in the struggle against fascism. The most effective thing you can do is to show up when there’s a call out. Even better, bring your friends and neighbours with you. The fascists get their power from mobilising in the streets and that’s where we need to oppose and confront them in numbers. 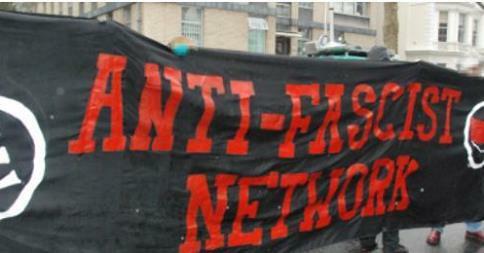 Check our action diary for upcoming anti-fascist mobilisations. Get involved with your local anti-fascist group. Support their mobilisations, offer your skills, time and information. The list of affiliated groups and supporters in the sidebar is a good starting point. If there isn’t an active and open local group, there’s still lots you can do to be effective with just a small number of people. See resources for anti-fascist action for tips on community organising, planning actions and more. If you’re up for starting a group, we can use our resources and experience to support you. Maybe we can help you put on a public meeting in your area to get a group going. See our guide on how to start an anti-fascist group for more. Support people organising to defeat upcoming far right mobilisations in whatever way you can. If you can afford to, donate us the cost of a pint using the button in the sidebar, or give some cash to your local anti-fascist group. Support people arrested for confronting the racists and fascists threatening our communities. Write to anti-fascist prisoners and donate to prisoner support groups. Some links at the bottom of this article. An effective anti-fascist movement involves all sorts of people and a diversity of tactics. It’s time to get involved.